In early June I had the unexpected opportunity to reconnect with an artist friend of mine, Joanne Young. I visited Homer Watson House in the rain and left full of excitement about Joanne’s exhibit. Here is the link to the that post. At the time an idea sparked: I contacted Joanne to inquire if she would consider a spot as a guest blogger. Joanne graciously accepted! The summer flew by and now it’s time to share and direct the spotlight on Joanne Young. 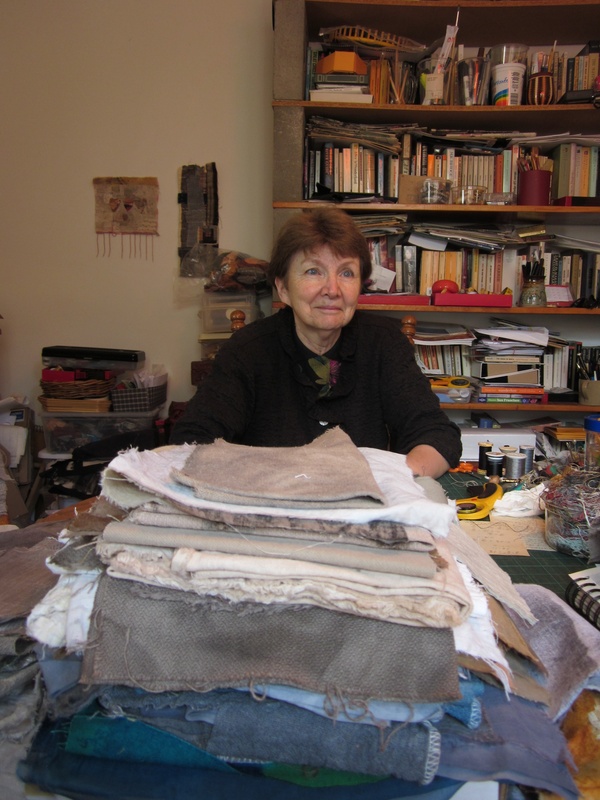 Joanne Young in her studio, immersed in fabric and other support materials. My name is Joanne Young. I am a friend of Anna’s, and after she saw my solo exhibition, Neighbourhood by the Tracks, at the Homer Watson Gallery in Kitchener, Ontario in June of this year, she invited me to be a guest on her blog. Here is my story. For most of my life I have lived in Kitchener-Waterloo, Ontario. In December 1999 I retired after thirty-two years of teaching highschool mathematics. I was only fifty-five, young enough to train for a new career. 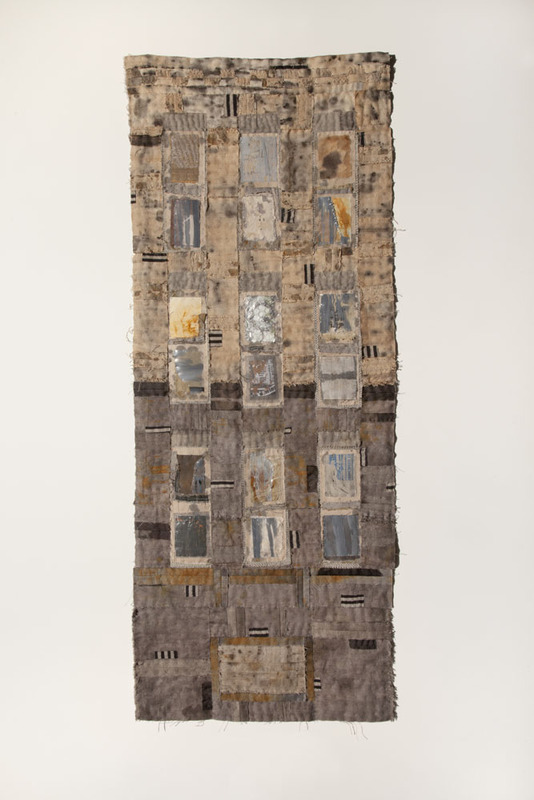 I was determined to reinvent myself as a textile artist. In October 2000 I enrolled in City & Guilds Patchwork and Quilting offered by Opus School of Textile Arts, London through distance learning. This school was headed by Julia and Alex Caprara, but is now unfortunately defunct. After eight years of intensive training I completed both a Certificate and a Diploma in Patchwork & Quilting. The highlight of these studies surely was an assessment exhibition held at the Museum of London in 2004. I completed my studies in 2008 and since then I have been a practicing studio artist. For the past thirty years I have lived in an old neighbourhood in a downtown section of Kitchener; it is close to a railway line and old factories. When I had to do a major project for the Diploma I started to investigate this neighbourhood with my camera. I was first attracted to rusting surfaces – rust on pipes, rust on trash cans, rust on cars. But I was really smitten when I came across a corner lot filled with bins piled high with metal scrap. I was attracted to the colours, the patterns, and the textures. My obsession with scrap resulted in my first series of works: Scrapyard, Landfill, King of the Junkpile, and Postcards from the Scrapyard. The most fun was a piece called Scrapyard Couture by Bertold of Kitchener. It consisted of two tiers: a large rusted spool that I had found in this recycling yard topped with a small roll of gutter wire. Sitting on the circumferences of these two levels was an assortment of handmade dolls. 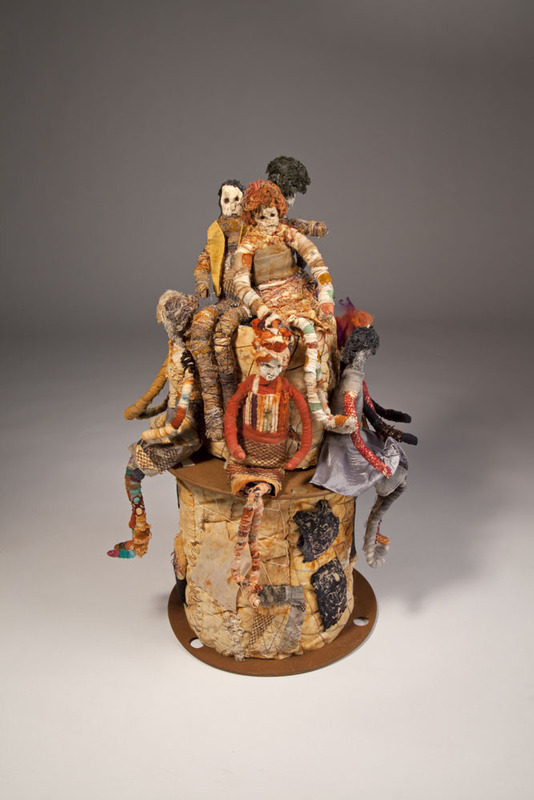 These dolls were about 12″ high with heads sculpted out of paper pulp and bodies dressed by me out of bits and pieces of scrap. I had fun as this scrappy company of dolls grew on my worktable. 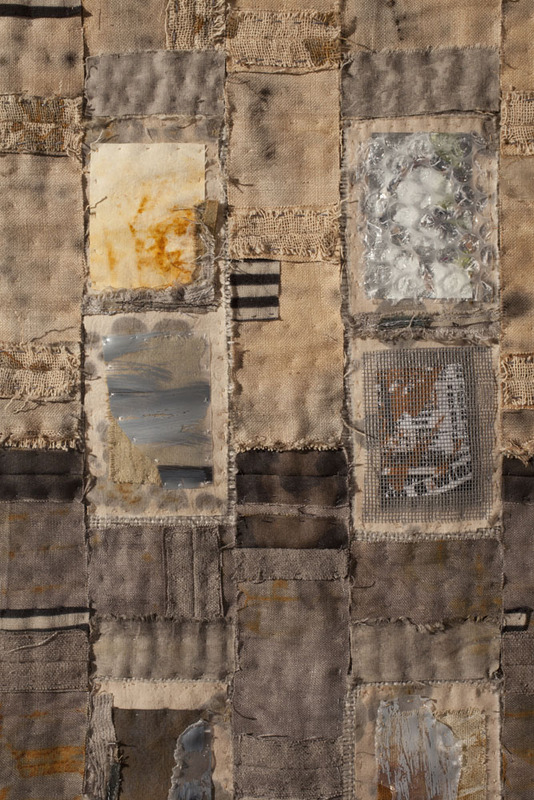 Scrapyard Couture by Joanne Young, 2011, 14”x14”x22”. Assorted fabrics, nets, meshes, paper pulp, wire. Another section of the neighbourhood that intrigued me was the factory district. The old factories face the tracks; I could walk along the tracks and photograph the windows. Particularly those of the old Boehmer Box Factory interested me; it has long ceased to make boxes and is now inhabited by artists and entrepreneurs who not exactly decorate the windows but, let’s say, make them graphic. So I left scrap behind for windows. I found that it is not easy to make windows and a wall interesting and spent almost a year making small pieces before I broke through with Colours of Abandonment which won the Homer Watson Legacy Award. Colours of Abandonment by Joanne Young, 2013, 16”x42”. Cottons, linens, silk, vintage Japanese fabric, screening, curtain fabric, plastic, bubble wrap. Rusted, dyed with tea and iron, hand stitched. Colours of Abandonment by Joanne Young, detail. To find out more about Joanne’s process come back on September 5th for “Materials and Process”, part II of this guest blog feature. 03 Sep	This entry was published on September 3, 2014 at 8:36 am. It’s filed under Art, Design, Exhibition, Guest Blogger, In the News, Networking, Recycle, Repurpose & Re-Create, Reuse, Sharing Resources and tagged City and Guilds Certificate and Diploma in Patchwork and Quilting, Colours of Abandonment, Homer Watson House exhibition, Homer Watson Legacy Award, Joanne Young of Kitchener - ON, King of the Junkpile, Museum of London, Scrapyard Couture by Bertold of Kitchener. Bookmark the permalink. Follow any comments here with the RSS feed for this post. Older: August CDAs – Intense with Inktense Pencils on Fabric! Thank you for sharing your bio, inspiration and work with Anna and with us. 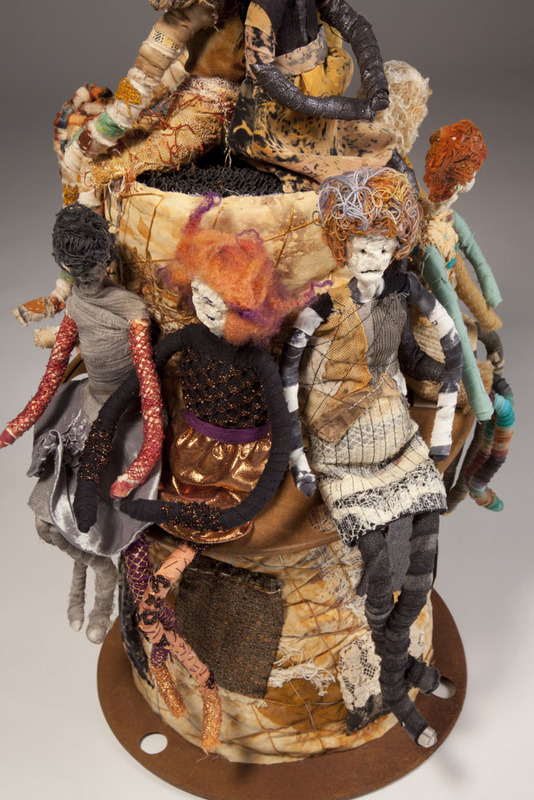 I especially loved your line: “I was determined to reinvent myself as a textile artist.” It’s a dream of mine to be a textile or mixed media artist. Go for it, Jeannette! It’s a lot of hard work, but it’s so worth it. I love the old factory. so glad I have been introduced to the art of Joanne Young. I should have included a photo of this factory, but as I didn’t do so, it’s left up to you to think about all those old factories you’ve seen. Very interesting, thank you for sharing this Anna…. Thank you, Carol, for taking the time to read my post. Wow! What memories you have given me. I grew up in that neighbourhood of old factories by the tracks & Railway Station in Kitchener. This was in the 1940’s, 50’s & 60’s. Thanks for sharing. Can’t wait for the next installment. Thanks for weighing in, Carol. Wow, Carol. I would never have imagined that this would happen. You wouldn’t know the old neighbourhood now. Big changes taking place. Thank you for sharing Anna. It is always a learning moment when one gets to see something from another artists perspective. I have admired Joanne’s work over her years of exhibiting at The Grand National. It is intricate, unique and fascinating. I look forward to seeing (hopefully) her entry/entries for “Connections”, the 2015 Grand National Show. Elizabeth – you are very fortunate to have seen and appreciated Joanne’s work over the years. Like you, I can’t wait to see what Joanne is presenting and exhibiting next. Hi, Elizabeth. I’m working on what I hope will be my entry right now. Glad you found this insightful, Katina! Even if my perspective is a little strange!